This is our first adenium use to develop new messy look. blooming, blooming durability, disease resistance, etc. To produce this new messy look is pretty harder than producing order style because there is few a parents which has flower this messy look. This’s gotta made me to create new parents comes up with this messy style myself. This time, I will show you how to produce new Rosy Adenium (Multi-Overlapping Petals) with new messy look in the name of “Sayonara”. The first release of Rosy Adenium with messy look. I need to have Rosy Adenium came up with colour on my goal set. I used Adenium single petal “Fresh Moroccan” crossing with Rosy Adenium “Dox Xon” (The first ancient of Rosy Adenium; the most stable and not impact to single petal or mother’s characters) and new baby grew up and become Rosy Adenium with only double petals. Next, we start crossing her with “Dox Xon”again and now this time I have got deep red Rosy Adenium with triple overlapping petals. I gave her a name as “Rose Maiden”. The 2nd step : Painting and making her to become new messy look. This step was very challenging and exciting because I had to create new messy look with my assumption. I used single petal “Aimo” (2008 variety) as mother and put the pollen (father) of “Rose Maiden” inside mother. According to my assumption, “Aimo” has white splash on her red petal and I thought she might give white splash dot on her baby. This is why I chose her as mother. Fortunately, I always get lucky (ha ha ha). I have got new Rosy Adenium with triple overlapping petals and messy style that I wished! I gave her a name as “The Heat is on”. I was very happy but not much because I didn’t get her colour deep red enough base on my goal. Just keep working on next step. The 3rd step: Creating another new Rosy Adenium with deeper red to cross with “The Heat is on” Due to Rosy Adenium “The Heat is on” is not enough deep red so we need to cross her with another Rosy Adenium with deeper red petal. To do this, we use Adenium single petal “Summer Rain”, big, round petal and deep red, crossing with Rosy Adenium “Rose Maiden” again. This time we got new Rosy Adenium came up with deep red and triple overlapping petals. She had no name yet, let’s said “New Rose Maiden”. The last step : “Sayonara” time! Now it’s time to make Rosy Adenium “Sayonara”. We used Rosy Adenium “The Heat is on” as mother and put the pollen (father) of “New Rose Maiden” inside. 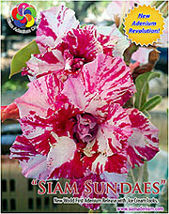 The outcome is new Rosy Adenium with messy look, splash cream white on every deep red petal layer. Don’t forget this was not end yet. You have to check on her flower stability like usual by grafting her scions with other small rootstocks before release to market. We have already done this and good news, her flower is 100% like parent. ok, that’s all for today. To produce new Adenium flower style is very fun and easy. We don’t only produce nice Adenium but we make JOY. Have a nice day.